Ian Synman played 154 games for St Kilda 1958-69. Played in Saints (only) premiership win in 1966, on Yom Kippur. Mordy Bromberg played for the Saints from 1978 to 1981. Michael Zemski played 8 games for Hawthorn in 1973 and 1974. Mr E. Michaeli involved with St Kilda VFL Club during proposed merger with Prahran in March 1888. Politician Walter Jona had major role in averting proposed merger of the Hawthorn and Melbourne Clubs in 1996. Dr David Berman president of North Melbourne 1924 and 1935-37. G.Morris Jacobs president of Geelong 1929-39. Reuben Sackville president of St Kilda 1947-56. Ern Joseph president of Fitzroy 1956-70. (This club later merged with Bribane Bears to form the Brisbane Lions. David Smorgan president of Footscray circa 2000, re-invented the club as the Western Bulldogs. Joseph Gutnik president of Melbourne circa 2000. He was the White Knight who emerged to save Melbourne from a merger with Hawthorn. Graeme Samuel was for 15 years a Commissioner of the AFL. Dr Geoffrey Edelsten president and owner of Sydney Swans 1985-6. Reuben Pelerman one-time owner of the (then) Brisbane Bears. 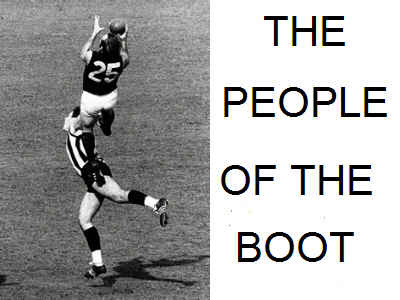 The opening pix of this page is of Alex Jesaulenko making a most spectacular mark during the 1970 Grand Final. Not Jewish, this legend of the game played for both Carlton and St Kilda, two teams which have had many Jewish fans. Jewish History Australia Click on the flag in top left corner to return to index page of Jewish History Australia.